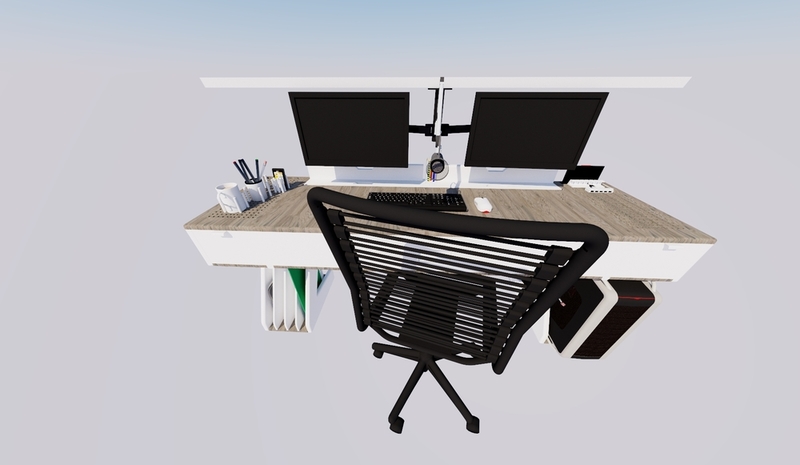 You may well remember back in October last year (Oct 2015) that I did a two part post on a design for a desk that I planned to build. Well it's now 10 months later, and as usual, nothing has been built. God, it's like a broken record around here! Now that I've published my AdVanTures, I realised that my needs have changed, and with an upcoming soundtrack to work on I needed to build something soon! 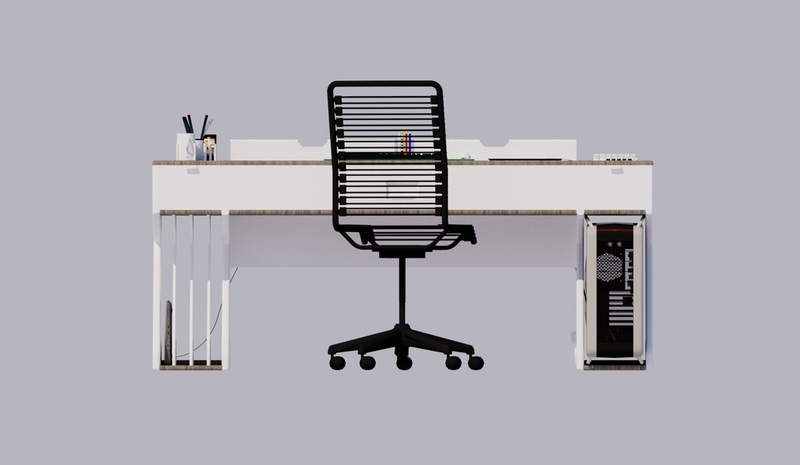 Thankfully, the desk construction was never started, because a lot needed to be changed from the original design as you can imagine with it now intended to be built in a van. 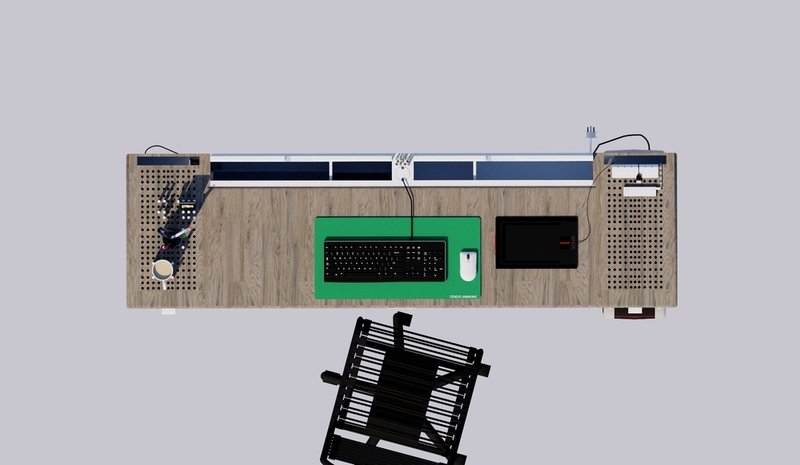 As you saw from the AdVanTure renders, the desk was redesigned then, but it's only in the last 2 weeks that I've refined that design further to a workable plan. Since that blog entry covers the redesign, in this entry I'll focus only on what has changed since then. The drawer unit that occupied the left hand leg of the desk has been replaced with a simpler 4 compartment slot for holding large but thin objects - such as my laptop, big sketchpads, a large mouse-mat etc. I felt this was necessary to allow easy access and stowage of the laptop. The drawers would only have promoted the storage of small bits and pieces that I probably don't need! The built-in cable run on the underside of the desk has been completely redesigned. The original was too complex, too fiddly, and not big enough to fit an extension lead in. The new one is easier to manufacture, larger, and has a built-in slot for an extension lead. It is also much easier to actually put cables into it in the first place. With the new space for the laptop, it creates an easy path for a charging cable to it, so you can leave the laptop charging even when it's stored away. The back storage nooks have also been modified. I didn't do any proper testing, and thus the original ones would have made it difficult to access stuff in them - the compartments were also too small, so have been simplified into 4 main compartments - one for A4 paper, one for A3 paper, one for electrical devices, and a large A3 sized one for folders. I have also shuffled them around, so the middle is now occupied by a new cable run (with circular removable grommet) and holes for pencil/pen storage. Another big change here is the removal of those sliding stationery holders/phone holders. As nice as the idea was, there's just not enough room in practice. instead, there is a safe place for charging devices in a compartment behind the right hand drawer! The surface of the desk above the leg sections has had a removable pegboard system added. 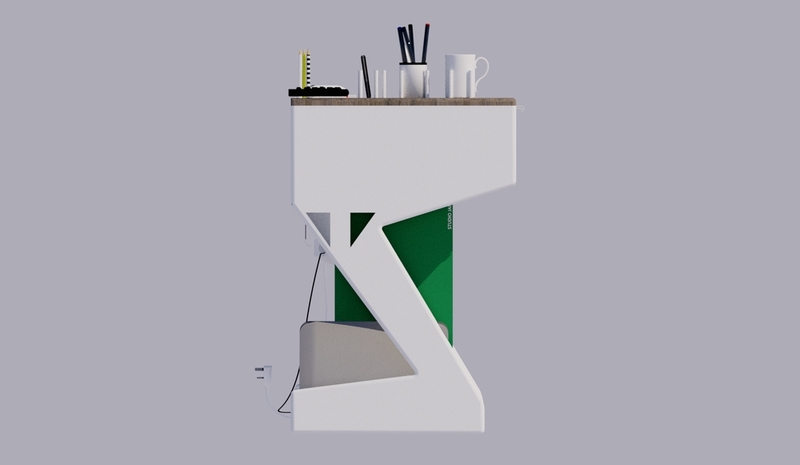 This was my solution to stop knocking things off the table, especially as the desk will be fitted in a van which will be on the move quite a lot. 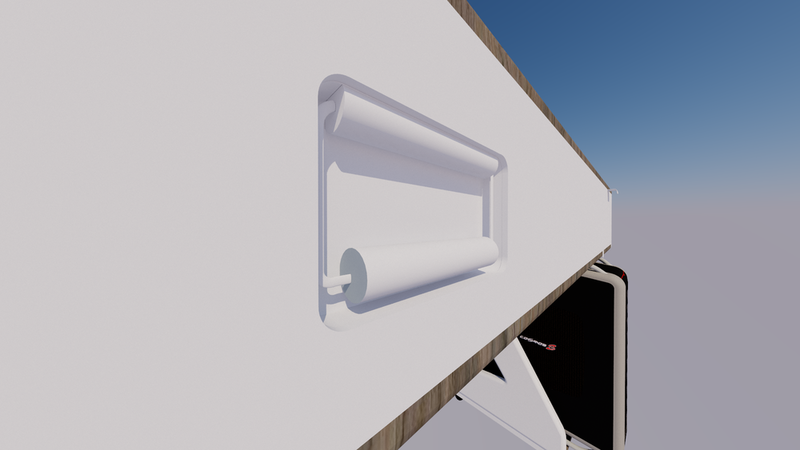 The holes are not spaced equidistantly, making it easier to fit awkward shape/length objects. The pegs will be stored in one of the two drawers. Also on both of these sections is a slot for cables/a tablet. This means electrical devices can easily be charged, with a wooden holder keeping the leads from falling back into the desk when not needed. The cable hole links up with the main cable run. ...the drawers have undergone a couple of changes. The right drawer has been shortened to allow secret space behind to store electrical devices, such as a mobile phone and headphones. The other reasoning behind this was to create a cable run for any cables running to the MIDI keyboard. Without this cable run, it would be easy to get the MIDI cable snagged when you open the lid! The left hand drawer is now where all the stationery goes. Pens, rulers, rubbers and not forgetting the pegs for the pegboard tops now have an easy to access storage location. This stationery tray simply slides into a rebated edge of the drawer. 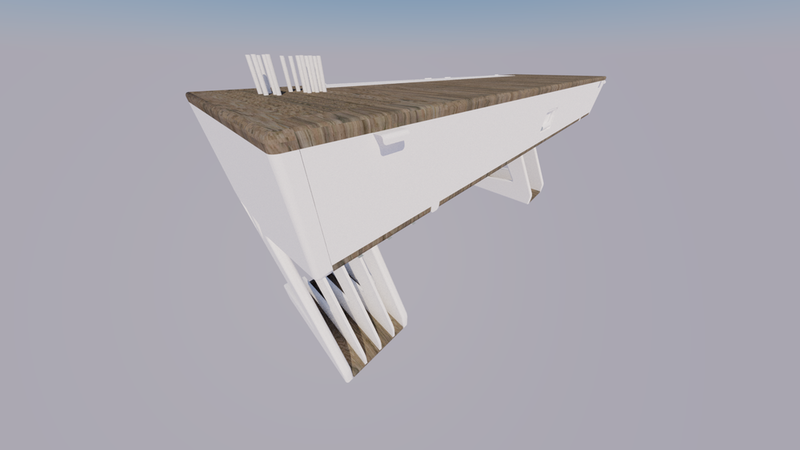 Most of the edges of the desk have been rounded with a 1cm radius. This has made a huge improvement to the aesthetics, and can easily be done with an appropriate sized router bit. It also means less sharp edges to get caught on, or bash into. 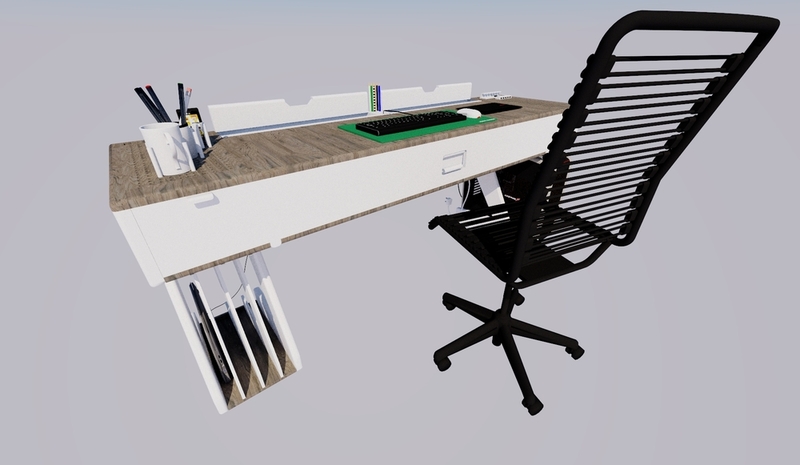 For this reason, the majority of the desk will probably be made of MDF - it takes to routing very well as it has no overall ruling grain direction. 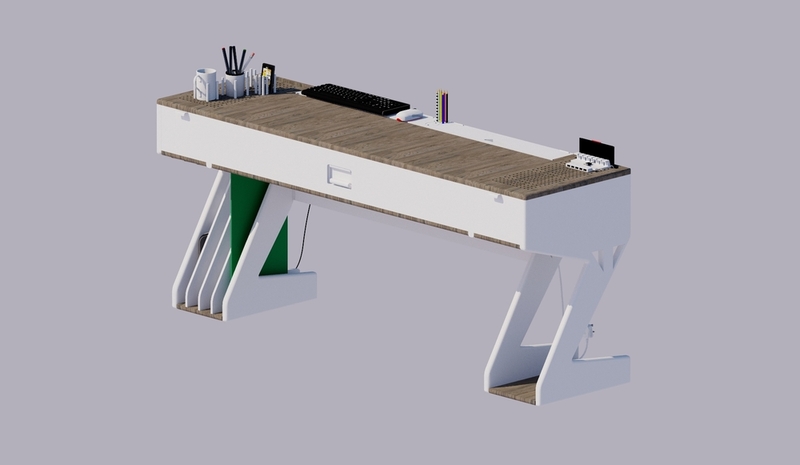 There have also been some other minor changes, such as slight variations in colours, and also a simplified locator for the lifting desk section (it now has a U shape channel to sit in, rather than a complex series of blocks). Speaking of which, here is a photo sequence showing the lifting lid in action. Clearance is tight, but should be just enough to access the buttons on the MIDI keyboard. And if I ever need to move it... a simple solution is a pair of castor wheels to sit under the 2 leg sections (it could be bolted in place quite easily). One of which has a handle. I'm slowly learning that less really is more! And so (for now!) ends a fortnights worth of design work! I expect there to be some slight modifications over the coming week, but hopefully nothing too drastic. As always, I hope you have found this blog post interesting. Please feel free to leave a comment or a like, or perhaps even share with your friends on social media. 'Till next time! With a big interest in tiny homes, and reusing otherwise underutilised buildings, I love to design my own tiny houses and work spaces. 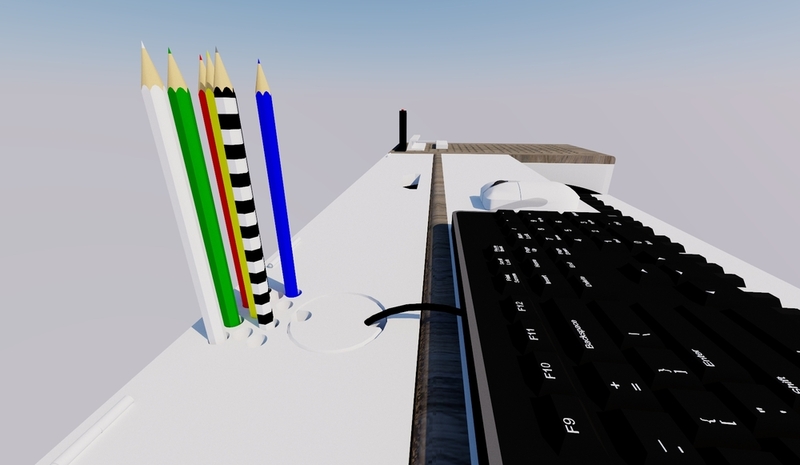 This blog contains full 3D designs with extensive write-ups and renders for your perusal! Composers Desk - An Update! Ever thought about living in a lighthouse? I have! Composers' Desk - Final Design & First Build Pics! Music Composers' Desk - Van Edition! Jam's Advantures Part III - Proper Renders!